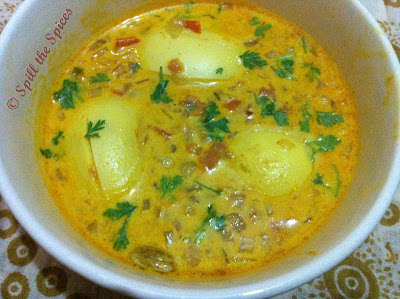 A delicious Kerala Style egg curry cooked in coconut milk that goes well with chapathi, rice, dosa, puttu and idiyappam and appam. 1. Hard boil the eggs. Make vertical cuts on the eggs and keep aside. 2. Heat oil. Add bay leaf, cinnamon, cloves and cardamom. Then add jeera and fennel seeds. When they pop, add onions and ginger-garlic paste. When onions turn pink, add the green chillies and fry till onions are lightly golden. 3. Add tomatoes and cook till tomatoes become soft. Add little water and cook for few minutes till the tomatoes are mushy. 4. Now add turmeric powder, cumin powder, coriander powder, red chilly powder and salt. Fry till the masala's are cooked. 5. Spread the gravy and put the eggs on it. Cover the eggs with gravy. Cover and cook for around 8-10 minutes so that the eggs absorb the spices. 6. Add the thin coconut milk and bring to boil. Cook for 2-3 minutes on low flame, stirring occasionally. Check for salt and adjust. 7. Then add the thick coconut milk and simmer for another 2-3 minutes. Don't boil too much as coconut milk will curdle. Garnish with coriander leaves.